Greg Rucka is one of my favorite comics writers, so the idea of a Star Wars: The Force Awakens prequel written by Rucka had a lot of draw for me. But while Star Wars: Shattered Empire (technically Star Wars: Journey to Star Wars: The Force Awakens: Shattered Empire) has its moments -- especially when Rucka, who excels in strong female characters, gets his hands on Princess Leia -- it falls short in what it seemed to promise. There is a big tie to Force Awakens, to be sure, but it's a tie really in name only -- it reveals nothing and really matters not to Force Awakens itself. I'd also argue that the four-issue miniseries is structurally unsound, reaching its crescendo in the third part and then petering out in the fourth, such that I was left at the end wondering if that was truly all there was to it. Shattered Empire follows mainly Rebel pilot Shara -- but also her husband, special Rebel groundtrooper Kes -- in and out of interaction with the main Star Wars cast, in the days after the Battle of Endor. The first issue is kind of about Han Solo (though he appears throughout), the second and third about Princess Leia, and the fourth about Luke Skywalker. Shara and Kes have a direct connection to Force Awakens, and maybe if I'd read this before I'd seen that I'd have had more of an "a-ha moment." 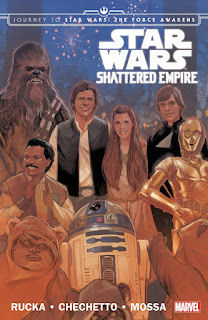 But as it is, Shattered Empire's end suggests something that doesn't bear out in the movie, and the story's overall lack of bearing on Force Awakens is significant enough that it makes it hardly worth reading as a movie supplement. There's a variety of items Rucka approaches in the story that would make interesting stories in and of themselves, including Emperor Palpatine giving orders posthumously, Leia sensing the spirit of Darth Maul on Naboo, and Luke Skywalker rescuing a Force-sensitive tree from the Empire's clutches. But none of these make up the plot of Shattered Empire, and rather Rucka flits from beat to beat, suggesting a lot but honing in on nothing. My guess is this isn't Rucka's fault but rather a limitation of writing in the Star Wars universe (and post-Return of the Jedi, no less). As such, however, not only is Shattered Empire not really a lead-in to Force Awakens, but it's also more of a Star Wars primer than really a Star Wars story. (The extent to which the "Empire" is shown as "shattered" in the book is also small.) Again, Rucka's strongest issues here are the second and third, in which Shara is significantly active alongside Leia. The first issue of Mark Waid's Princess Leia miniseries is also included in this collection, as if maybe someone in charge had a sense of this book's strong suit, too. Frankly, both of these stories serve to emphasize just how under-served Leia is in the Star Wars movies. Even as she's the quintessential strong Rebel princess, Waid's story takes up Leia's silence over the destruction of Alderaan precisely because George Lucas entirely glosses over Leia's feelings over the death of her family and entire planet. Rucka's story has way, way in the background Leia's new understanding that Darth Vader is her father (likely another franchise limitation), something else that Lucas drops on Leia but offers no opportunity for the character to actually reflect on. Strangely, Rucka's and Waid's stories are fairly similar, each involving Leia befriending a female Rebel pilot and each taking Leia to Naboo; Shattered Empire receives a further note of retroactive disconnect in that Rucka's story doesn't reflect that Leia had apparently been to Naboo before, in Waid's story, after the events of New Hope. I do get that Luke seeking out the Force trees in the end and giving one to Shara and Kes, who are retiring from the Rebel force, symbolizes the end of the Empire and the arrival of peace. But Rucka's conclusion is high on action and short on characterization, equally staying mostly out of Luke's head (Rucka's positing of Luke escaping the second Death Star in an Imperial ship and nearly getting shot down is a cute bit, however.) The four-issue story gets only a two-page denouement, of which Shara and Kes's reunion is a scant four panels. The metaphor aside, the story just ends, and though we get a conclusion of sorts for Shara, it doesn't feel like enough at the end of a story already lacking in connective tissue -- letting alone that we know from Force Awakens that any sense of peace here is fleeting anyway. Chuck Wendig's Aftermath, at least, suggests that the war is not over, not that it is. Mainly what Star Wars: Shattered Empire does for me is make me want to go read Mark Waid's Princess Leia (and also reminds me that I ought be picking up another volume of Greg Rucka's Lazarus). Were Marvel to announce a Shattered Empire II -- that maybe picked up on that Leia-on-Naboo-sensing-Maul bit -- then I'd recommend this book in a heartbeat. Wholly disconnected, though, I'm not sure this Force Awakens lead-in makes a stronger case for your dollars than other books on the stands. Interesting, I've been hearing tons of perfect positive feedback on this series. But as a side note......ugh, why are there so many great books out? I've been trying to add to my DC collection in the past year, but now Marvel goes and does Star Wars Bonanza....too many choices, too many choices. Also, now that you read good few of the Star Wars books, do you think it's helped or enhanced your Star Wars Universe knowledge, or is it more like fluff that if it weren't made you wouldn't miss it? Fluff, unfortunately. I've really been trying to give the new spate of post-EU Star Wars books a fair shake, but between A New Dawn, Aftermath, and now Shattered Empire, nothing has thrilled me. One, I've found the novels boring. Two (related or not to the first), they're all very much about side characters. This may be a symptom of how early this is in the publishing line of the new Star Wars universe that licensed fiction can't do anything with the main characters just yet, but I don't have that much interest in a different ragtag group of Rebels (Aftermath), especially after I just got into one on Rebels. In comparison, Star Trek fiction is all about the cast you know and love, though the difference -- related to this point -- is that without these characters on the screen any more, licensed fiction can use those characters more freely, which Star Wars fiction can't. Third, I do also feel burned that neither Aftermath nor Shattered Empire, both billed as "Journey to Force Awakens" books, contained much Force Awakens contents at all. Yes, I know how they both tie in, but it's just so slight (as opposed to say, showing how the First Order came about) that neither book lived up to their respective hypes, and that's a bad way for post-EU Star Wars fiction to start out. Yes, I'll read the other parts of Aftermath, and Bloodline looks promising, but I don't at the moment think Star Wars fiction really takes my dollars seriously. Marvel's Darth Vader was good, and Mark Waid's Leia looks promising. I do like what seems to be a trend toward integrating the prequel and original trilogies more completely. It feels like it was just like a sight-seeing tour to the post-ROTJ Star Wars universe. Like Star Wars Hush or something. I heard they were making a new hardcover edition of shattered empire with the James Robinson C-3PO special instead of Princess Leia #1 and Star Wars (1977) #1.